Overview: Rechargeable, state of the art 4000mAh built-in battery effectively provides well over a 150% charge to your iPhone 6 Plus to last you the entire day. Only compatible with the 5.5 inch model. Apple MFI Certified Chip is approved to work with all functions of your iPhone 6 Plus. Full compatible support with iOS 8 and future iOS software updates. Ultra slim rubberized encasing provides complete protection and minimizes bulk. The BX150plus has gone through extensive testing for quality assurance. In an effort to make the case as slim as possible, we have designed the case to be flush with the screen. We've included a high quality screen protector for added screen protection. Easily insert your iPhone 6 plus into the lightning output port. The battery case uses a MicroUSB input port to enable power and data transfer. You can conveniently charge and sync both the battery case and iPhone to your Macbook, PC or Laptop without having to remove the case itself. A microUSB cable is included. Package Contents (Retail Packaging) - 1x battery case, 1x headphone adapter cable, 1x microUSB cable, 1x screen protector, 1x user manual and 1x warranty card. 3.5mm Headphone Adapter Cable to plug in headphones/earbuds or auxiliary cable. Standard microUSB cable (can be used for data transfer for iOS and PC compatible devices such as Macbooks and Laptops to sync music and files. 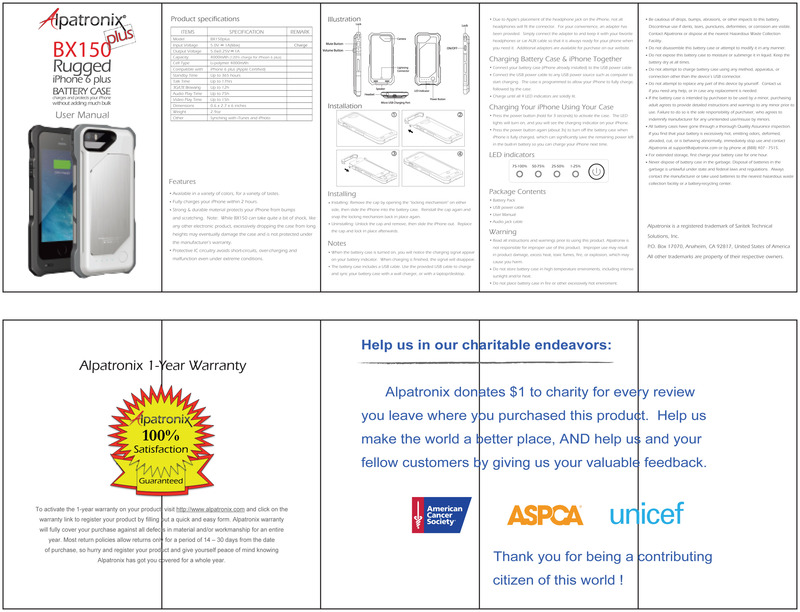 Alpatronix is a registered trademark of Saritek Technical Solutions, Inc. All other brands are registered trademarks of their respective owners.